Cheese fanatics will find a fresh slice of heaven here in the Amish Country area. The silky smooth and savory treat is a huge hit for both natives and visitors alike! Locally made and infused with delicious flavors, these cheeses are sure to satisfy your cravings. Join us at the White Oak Inn for a weekend of sampling the best cheese in Ohio Amish Country! Learn more about the best treats in the Amish Country area in our Vacation Guide. Our recommendations for the best restaurants, shopping, and events will provide you with everything you need for your ideal vacation. Take a look to discover some of the best shopping destinations for cheese nearby. You’re soon to find why browsing these endless selections is one of our favorite things to do in the Amish Country area! For some truly premiere selections, you have to visit Guggisberg Cheese in Millersburg, Ohio. In the 2018 Ohio Swiss Festival, their Premium Swiss variety placed first in the Swiss Category, and their Baby Swiss placed first in the Open Category. They’ve created so many award-winning cheeses over the years that it’s impossible to make a wrong choice after browsing their selections! Heini’s Cheese has been producing cheese since 1935. Created 100% with milk sourced from local farms, it’s some of the freshest you can find! They also pride themselves on their famous Cheese Fudge, which comes in sweet flavors like chocolate peanut butter and rainbow sherbert. In 1977, 21-year-old Mark Coblentz started selling cheese in a pickup truck from a refrigerated box. He built such a large client base that his business was able to grow into the store he now owns today, Walnut Creek Cheese. Now, he not only sells cheese, but also baked goods, bulk food, and anything in between. His hard work has created one of the best places in the area to purchase delicious cheeses! Our nearby location to all of the best cheese in Ohio Amish Country is perfect for a day of touring each of these fantastic stores. After a day on your feet, our comfortable and relaxing accommodations are also ideal for unwinding in peace. 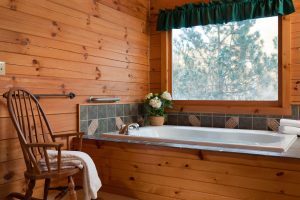 For the ultimate getaway experience, you’ll want to book one of our secluded log cabins. Tucked away in the serenity of the woods, open the door to your cabin to discover a spacious living area complete with a plush sofa and an inviting fireplace. Take a dip in the large Jacuzzi-style whirlpool to put your mind at ease, and later, cozy up in your king size bed for a great night’s sleep. There’s no better way to finish the day than in this lovely accommodation in the Amish Country area!